This updated 4 bedroom/ 3 Bath, spacious and sunny townhome, is an end-unit, located just steps from the Free Red Shuttle Line. This home is perfect for multiple families to share. Sleeps 12 in beds. Walk to Starbucks, Von's, Movie Theater, Park and Mammoth Creek. Recently remodeled, new hardwood floors, carpeting, slate & stone throughout. Wifi, Netflix's, Pandora, BlueRay DVD players in every bedroom. -Spacious great room with vaulted ceiling & wood burning fireplace, dining area (seats 6), bar (seats 3) and kitchen. Large private deck with gas BBQ and outdoor table with with seating for 6. -Second master w/King bed, 40'' flat screen. -Queen bedroom with 32'' flat screen, DVD player. -Bunk room with 2 sets of bunk beds, 40' flat screen TV, DVD player. -Bath with double sinks, separate shower and toilet area. Free Wi-Fi, Cable TV, Netflixs, DVD players. Flat screen TV in all 4-bedrooms and great room. Fully stocked kitchen for entertaining a large group. New appliances; microwave, large oven, Dishwasher, coffee maker, mixer, blender, crock pot, etc. Luxury linens and soaps. Hair dryers. Ski and Snowboard racks & storage. Sleds and saucers. BBQ on spacious private deck. Extra ammenities include: In-unit laundry (washer and dryer) located on the first floor. Pack and play,high chair available in the master bedroom closet. An extension gate is located at the top of the stairs for child safetly as well. Communal Large jacuzzi, dry sauna and swimming pool (not heated in winter). Megan Herbst has managed vacation rentals since 2005, with a personal touch and attention to detail that has enabled her to maintain long standing owner relationships and repeat guests season after season. Our Vacation Rental management company is a boutique operation that stands out as truly unique among the large corporate property management operations common in the area. Megan is directly involved in every aspect of daily operations and still personally confirms every reservation in an effort to better know her guests and to meet the needs of both guests and property owners. 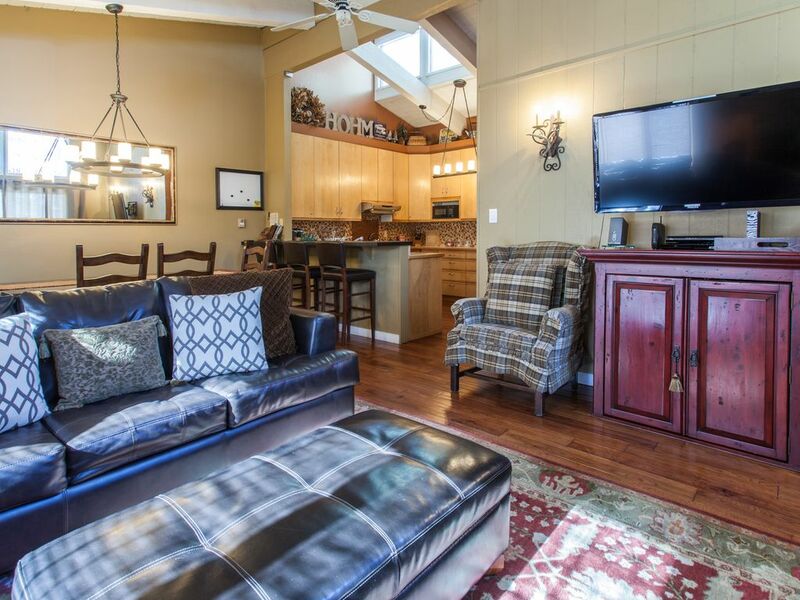 Aided by the loving support of her husband Jason, her goal is simple: to ensure a memorable and rewarding experience to every guest by offering the finest selection of luxury vacation rentals in Mammoth, with outstanding guest service to match. My vacation rental company has been such a joy to own and manage. My true passion is to help people plan the perfect vacation. This isn't just a business I operate, I live and breathe the experience of my guests and owners every day. I thoroughly enjoy getting to know my clients and helping them customize their Mammoth vacation to their needs; from choosing the perfect property to recommending local activities, restaurants and shopping. While many of our guests hail from Southern California, we are proud to regularly cater to a truly global clientele, and understand the needs of today's cosmopolitan traveler. I hope you too will frequent our vacation rentals and enjoy your stay in Mammoth!” - Megan Herbst Megan holds a Bachelor's Degree in Psychology from the University of California, Santa Barbara with a strong background in hospitality management, sales, and marketing. In addition to operating a vacation rental company, Megan often advises other resort management companies as a consultant. Her husband Jason also holds a Bachelor's degree from UCSB in Film and Media Studies and has a background in real estate finance and transactions. Megan and Jason invite you to come experience the difference that our vacation rental company has to offer! toilet, combination tub/shower: toilet, combination tub/shower, Private tub/shower area. Two sink vanity. Make-up mirror. toilet, combination tub: toilet, shower, Slate walls & floor, Hansgrohe shower head. Tub to soak in! toilet, shower: toilet, shower, 2 vanities. Private shower/toilet area. Perfect for kids. Every bedroom has a TV and DVD player. We have a lot of DVD and VHS video for you to watch. Sorry, Monopoly, Checker, Candyland, Pictonary, cards, etc. sleds and saucers in the closet under the stairs. Dry sauna by the jacuzzi with showers and bathroom. Great in the summer, chilly in the winter. Large outdoor covered Jacuzzi, just across the driveway. We had a great time staying at this property with our group of 11. Everyone had their own space, kids down, adults up. Ideal location, too. Fantastic stay for first time in mammoth! Megan's beautiful home was just the perfect place to hang out with my friends, especially being close to the town to get anything we need or for going out. Her home was nice and cozy and very clean. So loved how it was so close to the bust stop. Would love to stay here again. The home was perfect. We all had a wonderful time. It was a gathering for my wife and my 50th. Anniversary. Our two sons and there families joined us everyone had a great time. Had a nice time this weekend despite the smoke limiting afternoon activities. We were sure glad the unit had a couple of fans because we had to keep the windows closed for a while. The unit is set up well for kids with the bunks in the 4th room. That became kind of their home base while the adults could spend time chatting up stairs. The windows were just replaced in the living room and are nice. The slider could have used a screen, but I’m assuming that’s coming. Wouldn’t be an issue in the winter of course. The kitchen has been expanded nicely compared to the original floor plan. It affords a lot more space than what I remember in these units. They could use a counter depth refrigerator so all the drawers adjacent to it could be used. Our group would definitely stay here again if the opportunity arises. 2 families. Everthing was clean, upgraded, and amenities as stated. A great location as well! We had a fantastic stay here. We are a multi generational family. There was room for us all comfortably. Coffee on the patio was such a joy. The neighborhood was quiet. This was a perfect house for our family of 10! We would definitely come back!